At the Vale Centre in Port Colborne, Ontario on January 21st, the third place Niagara Whalers hosted the seventh place Windsor Aces in a south division Greater Metro Hockey League match – up. The Whalers were coming off a 10 – 1 loss in Port Colborne to the first place St. George Ravens on January 19th. 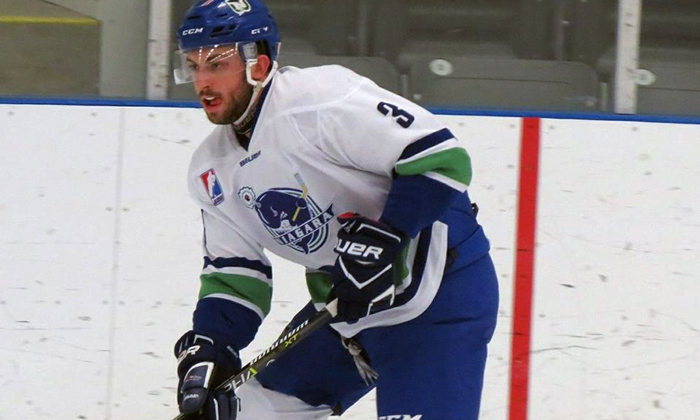 Jake Lloyd led Niagara in the 10 – 7 win over the Aces with two goals and three assists on Sunday evening while Frolov Mikhail registered a hat trick and one helper in the Whalers win. Four players had three points at the Vale with Ethan Spaxman and Steven Farano scoring two goals and one contributor along with David Christopher with one goal and two assists. Zach Main also had three helpers in the win. Patrick Desjardin and Sam Martin contributed on two goals for the Whalers as well as John Swiatek and Mitchell Chastelet also earning one helper for Niagara. Goaltender Will Harvey stopped 31 of 38 shots in the Whalers 10 – 7 win over the Aces. The Whalers will now face the Aces in Windsor on January 27th in a 7:30 p.m start.